This is the foyer (entryway) of our virtual house. Here you can access the hallway, leave the house, read junkmail left on the floor, and look outside for a glance at the weather. Exit the house. We hope you have enjoyed your stay! 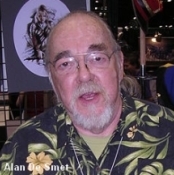 Gary Gygax passed away on March 4, 2008 in his home. Gary was the co-creator of Dungeons & Dragons, and his creation has brought years, nay decades, of enjoyment to me and my friends and now to my two sons. Rest In Peace, Gary. Dave Arneson passed away on April 7, 2009 in his home. Dave was the co-creator of Dungeons & Dragons, and his creation has brought years, nay decades, of enjoyment to me and my friends and now to my two sons. Rest In Peace, Dave.